Karibu! Welcome to The Basket Room's Online Media Press Lounge. Your one stop download shop for all things woven! Read about our newest designs, trends and what's next in the interior's world. So get comfy, grab a cuppa and meet our team below! The Basket Room is an interiors brand specialising in handwoven storage baskets for the home and accessories. Founded by Camilla and Holly in 2014 who met studying fashion design at art college, and have come together years later after gaining experience in design, production and retail to found The Basket Room. Holly started her ethical journey in fashion on a road trip from South Africa to Nairobi, when her eyes were opened to another side of the industry. Camilla quit her fashion job in London to explore her dreams of sourcing intricate and locally crafted decorative products from this East African hub of creativity. Basket weaving is a craft as old as mankind. For millennia, folk have been binding and plaiting natural fibres, weaving vessels of all shapes and sizes for trading, storing and transporting goods in. Anthropologists have found evidence of basketry buried beneath the pyramids of ancient Egypt, and with the help of explorers who have roamed the world for centuries, different methods and styles of basket weaving have reached all corners of the globe. And the journey continues today as we continue to explore Africa in search of the most remarkable weaving communities: women plying their precious trade as their mothers, grandmothers and great-grandmothers have taught them to. Buying our baskets helps ensure that daughters and granddaughters will continue to weave, and continue to benefit from the fair wages and dignified working conditions that come from working within a cooperative. SS19 - NEW BABY MOSES BASKET DESIGNS! Holly heads up our Marketing, Sales & UK Office. A lover of all things natural, you may find her walking in the woods, practising yoga or knitting. Camilla is the production Queen who knows all there is to know about baskets, quality control and weaving! Find her drinking a green smoothy with a cat on her lap, navigating her spreadsheets. Anna is our Wholesale guru, if you have a shop & would like baskets she's the one to ask! Find her drinking earl grey tea, speaking in French to her children and on the board of many committees in her community. Ella is our millennial customer service chief, social media assistant and photoshoot stylist! Graduate in English & Art History you'll find her travelling to all corners of the world, designing & creating and planning the next adventure with her friends. Alice knows a thing or two about words and is our marketing, copywriting PR star! In between looking after 2 little ones you'll find Alice at her local book club, flower farm or coffee shop! "Jazz up a corner of the room with an array of pretty woven baskets filled with plants." "‘This artisan company’s handicrafts support communities all over the world. The colours are beyond beautiful, as is the workmanship’"
"Add a burst of colour to your home with these handwoven sisal rugs and runners from the Basket Room. " 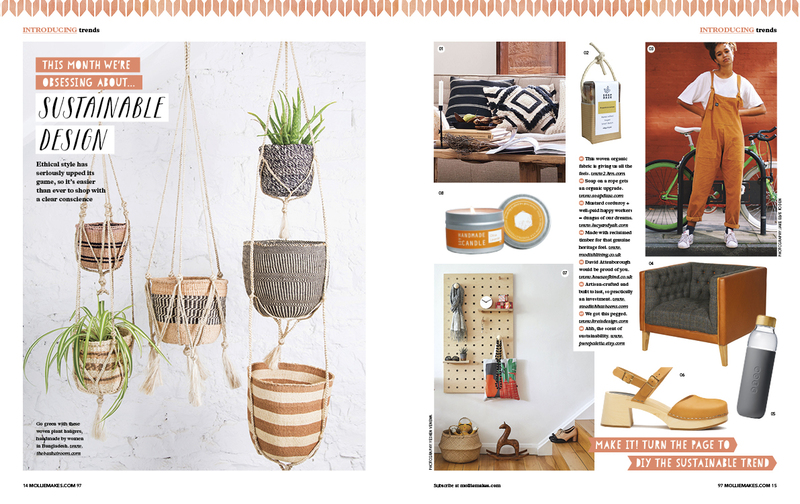 "If you buy just one thing this month, make it a colourful bike basket from ethical lifestyle brand The Basket Room"
"The Basket Room's bright storage is ethical, stylish and practical"
"If there’s one thing I love, it’s a purchase with a REALLY good back story." "A powdery confection of rose blush and candyfloss"
"The Basket Room is a bit of a HomeShoppingSpy favourite"
"Wonderweave, go for textured accessories"
"Who could resist these lovely Njano baskets decorated with yellow and white beads?" "The only difficult decision will be which one to choose!" "Store your bits n bobs in The Basket Room's gorgeous range of ethical baskets"
"Ethical, useful & stylish. What more could you ask for?" "It means that we’ve finally started buying baskets we actually need – they are perfect for toy storage for example – rather than adding yet another French shopping tote to our collection." "These colourful baskets make me really happy."